Daniel Oest is your average 31-year-old guy living in Grand Junction Colorado. He spends his days working at a power sports shop, and after work, he likes to ride motorcycles and spend time with his two little boys. 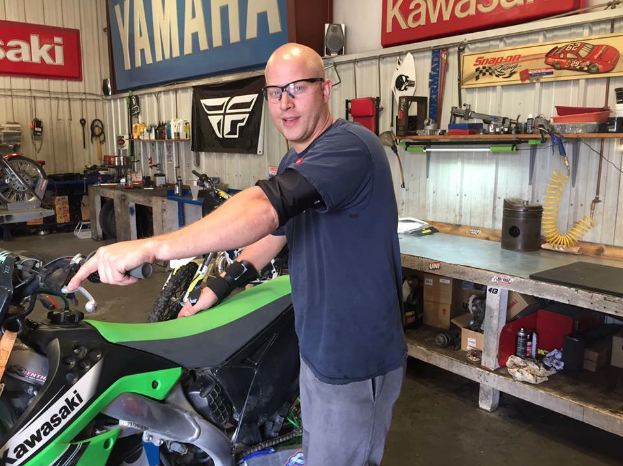 Daniel is always working with his hands, whether it’s fixing a bike or a boat at work, or scooping up one of his boys; he depends on his hands. So when Dan got into a motorcycle crash, life got complicated. OF COURSE, IT WAS HARD TO HAVE A BROKEN HAND AND WRIST, BUT THE BIGGER PROBLEM CAME BECAUSE OF AN INFECTION. The pins put into his wrist to heal the injury got infected, and the doctors felt that the best course of action was to give Dan IV treatment through a PICC line. This way Dan could still work, and heal his infection, at the same time. Now Dan was relieved he could go back to work. He had a family to support and bills to pay, so taking time off was not an option. However, once he got back to work, this relief quickly moved into stress. DAN WAS WEARING THE NET COVER THAT WAS GIVEN TO HIM BY THE HOSPITAL TO PROTECT HIS PICC LINE. One day while he was working on the inside mechanics of a boat, the netting got caught and suddenly he realized his PICC line had been pulled out a few inches. Dan was fine, as the PICC line didn’t come all the way out, but for anyone with a PICC line – especially one for curing an infection– this is hard to take lightly. If that PICC line had come out further, it could put Dan in a lot of harm. The netting was already catching on everything, but this was the last straw for Dan. He knew he had to find something that would keep his PICC and himself safer while at work. He wasn’t going to let some medical looking netting get in the way. Dan started to research PICC line covers to proect and cover his PICC from infection or contaminants, and after finding too many with cheesy patterns and heavy fabric he came across PICCPerfect. He liked the breathable fabric, and the black color was nice and neutral. “It fits my taste perfectly” and it “changed how I did things. I did not need to worry anymore”, Dan dangerous. DAN COULD GO TO WORK FREELY AND NOT HAVE TO THINK ABOUT GETTING THE NETTING CAUGHT OR THE PICC LINE BEING PULLED OUT. Also, when he had the netting and his PICC line was exposed, Dan said the following: “They look at me like I am contagious,” they being everyone who saw his PICC line exposed. With the new cover, he said people would barely even notice, so those odd stares started to vanish. So while Dan was no longer feeling like a walking disease, he was also feeling better about his treatment. He did not have to mess with the netting anymore to change his medication. He told us that sometimes meandering through the netting took longer than the actual switch of medicine. With the new cover, he could change it fast and get right back to work. Dan said that when you live with a PICC line everyday life “can be a bummer”. From having a hard time at work, to the constant care taking up time, to the lack of sleep because of stress. Everything in everyday life felt unsafe, for the fear of the PICC line being pulled. BUT DAN EXPRESSED THAT PICCPERFECT IS LIKE HIS SAFETY BLANKET. Not only does he get to work with ease, but most importantly he is able to spend better quality time with his family. He can be outside hiking, playing catch with his boys, fetch with the dog, and just living his life to the fullest. PICCPerfect not only gave Dan safety, but turned this setback into stress-free treatment. This stress-free treatment made it possible for him to get outside, stay active, and continue to be an amazing father. Dan truly is able to #LiveMightyWell!